On a beautiful Thursday afternoon September 13, composites professionals from across the US gathered to raise scholarship money for Winona State University Composites Engineering students. 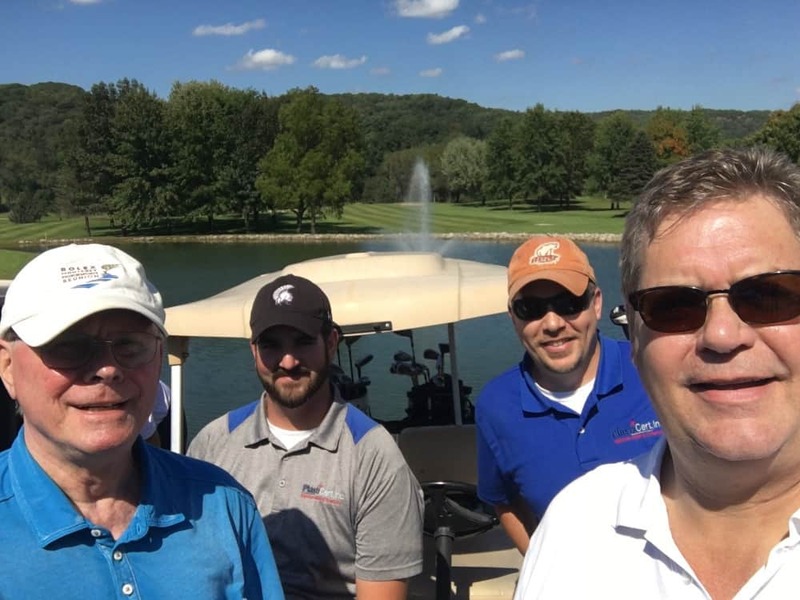 The Winona Area Composites Consortium and The Winona State University Alumni Office brought together composites companies to participate in the 16th Annual WSU-Miller Brothers School of Engineering Golf benefit. The venue was the beautiful Cedar Valley Golf Course, tucked around and into the Mississippi River bluffs just south of Winona, Minnesota. Since 2005 with its first scholarship award, this event has raised $150,000 over its history. The committee has retained $100,000 of that for an endowed scholarship fund to guarantee future awards, the difference having been awarded to students. Now each year, the majority of the money raised goes directly to scholarships. In 2017, the Scholarship committee awarded funds to 15 students, 13 existing and 2 transfers. Recent changes to the fund allow for awards to transferring students as well. After this 2018 event, and reconciling expenses, the committee is looking to approach last year’s numbers! Local companies that make up some of the SE Minnesota “Composites Cluster” like, PlastiCert, PlastiComp, first time participants Miller Ingenuity, Solvay, Celanese, and RTP Company participated. Other companies that were golfing included United Initiators, Elkem, Bamberger Polymers, GC Brandt, PolyOne, Advanced Fiber Products Mitsui HM Royal, St. Louis Group Composites One, Chemours, Birla Carbon PlastiCert, Superior Oil, Arkema Clairant Corporation Syncot Plastics Chempoint. RTP Company was a significant contributor as well as provided the evening’s main door prize, a VIP ticket package for a Minnesota Wild vs Washington Capitals hockey game this upcoming season. Door prizes were provided by many suppliers to the composites industry: Specialty Minerals, Albemarle, Chase Plastics, Amco, Hexcel, Arkema, Solvay, United Initiators, Invista, Miller Wood Products Winona State University, Covestro, Owens Corning, Sonneborn, Entec, Chemours, and PlastiCert. The benefit golf event included a lunch to allow some reconnecting and networking, followed by a 1:00 PM shotgun start. The scramble format made for a competitive event with some low scores posted. The social hour followed golf and then a dinner shortly afterward. Key individuals in attendance at the event included MN State Representative Gene Pelowski, the legislator that wrote the House Bill funding the start-up of the composites program over 30 years ago. Winona State University President Scott Olsen and his wife were present to thank the participants for their support. Also in attendance were Composites Materials Engineering Department Chair Fariborz Parsi, Mark Reitan WSU Director of Alumni Relations and Annual Giving, and three current students that were past recipients of scholarships, Micah Callies, Jace Pink, and Tyler Ross. A short program followed dinner where attendees heard from the three past scholarship winners about why they chose WSU’s CME major, their highlights of their CME education so far, and what receiving the scholarship meant to them. Steve Maki, VP of Technology at RTP spoke on their positive experiences hiring graduates of the WSU CME Program and Mark Reitan spoke thanking participants again but also encouraging participants to refer prospective students to the program. For more nearly 30 years, Winona State University has been educating and graduating students from the only undergraduate engineering program in the United States devoted to the study of composite materials. Since 1947, when Ben and Rudy Miller began mixing high-quality cotton fibers with plastic resins, composites material engineering has been a recognized knowledge cluster in Southeastern Minnesota. The Miller Brothers early development efforts inspired numerous companies and spin-offs, building on their successes. The WSU-Miller Brothers School of Engineering boasts about their graduates now applying their acquired knowledge throughout North America and around the globe. For more info go to www.winona.edu/engineering.